Our God Saves arranged by Dave Williamson. For SATB Choir. Choral octavo. Duration 4'40". 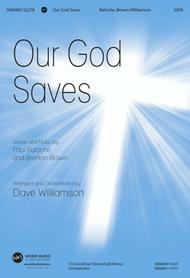 Published by Word Music (WD.080689132278).Easy to teach to your congregation, the Paul Baloche/Brenton Brown song Our God Saves is musically memorable and delivers a strong statement of spiritual truth.